Miniature oil lamps are beautiful reminders of Victorian days, glistening in glass, china, porcelain, brass, and silver. Most were made in the mid-to late 1800s, though the fashion lingered somewhat into the early years of this century. The variety is staggering; lovely glass lamps can be found in a wide range of textures and colors, while china lamps often appear as figurals, or with hand-painted designs. Styles range from the typical delicacy of the Victorian parlor through daring Art Nouveau elegance. Collectors have learned to delight in the endless combinations of beauty and practicality that can be found in miniature lamps. The reference features almost 450 lamps never before seen in any book, with color photographs, detailed information, and current values for each. 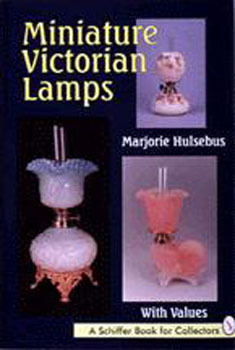 Collectors and dealers of lamps, glass, and Victoriana will find this book a must for their reference library.